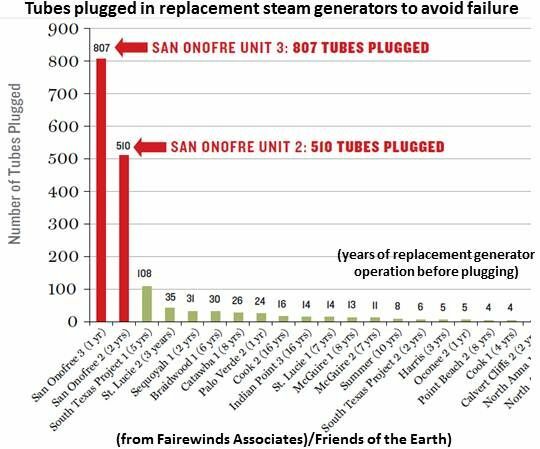 How Broken Is the San Onofre Nuclear Plant? 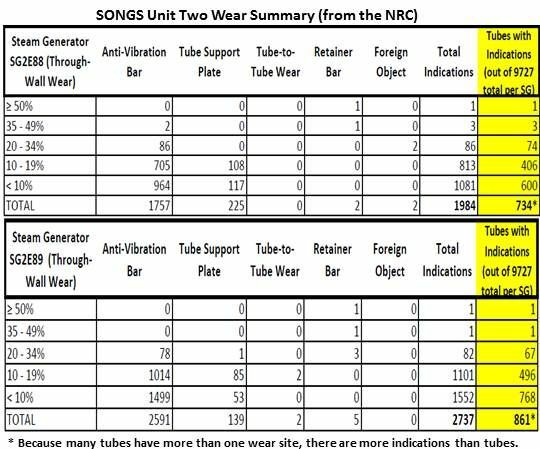 The NRC provided numbers, and a nuke watchdog group provided context. 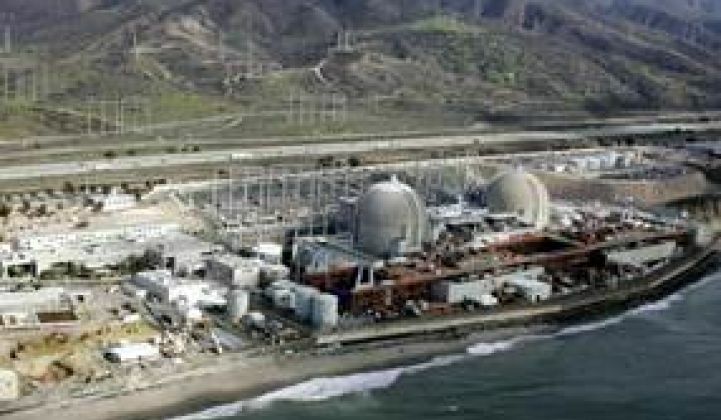 California’s transmission system operator is scrambling to meet a load deficit caused by the 2,300-megawatt outage of the San Onofre Nuclear Generating Station (SONGS). The system operator is bringing shuttered natural gas plants on-line, calling for Southern Californians to conserve electricity and warning of the possibility of blackouts. The two steam generators (2E088 and 2E089) of the 1,172-megawatt Unit Two at the SONGS were replaced in January 2010. The two steam generators (3E088 and 3E089) of the 1,178-megawatt Unit Three at the SONGS were replaced in January 2011. Unit Two began a scheduled outage for refueling on January 10, 2012, and was out of service when control room operators shut Unit Three down on January 31, 2012. Both units have been offline ever since. Neither is expected to be ready for service before the end of this summer. Without recently activated transmission and the other efforts, California Independent System Operator Director of Communications Stephanie McCorkle recently told GTM, the LA Basin would be short 240 megawatts on a high-demand hot day, and the San Diego area would be short 337 megawatts. With them, she said, there are reserve margins of only thirteen megawatts in San Diego and 212 megawatts in the LA Basin. The SONGS Unit One was first-generation Westinghouse technology. It went on-line in January 1968, and was built to last until 2004 but was decommissioned in 1992 due to wear. Unit Two went on-line in August 1983, while Unit Three went on-line in April 1984. Both units rely on an old and less efficient technology built by Combustion Engineering (subsequently bought by Westinghouse). The replacement of the steam generators at the SONGS was done by Mitsubishi Heavy Industries. The steam generators are where the heat generated by the light water reactors turns water into the steam, which drives the facilities’ electricity-generating turbines. 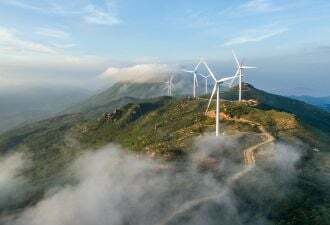 This type of turbine can also generate electricity with steam created by water boiled with coal, natural gas, geothermal stations or concentrating solar power stations. Each SONGS steam generator is 65 feet tall and weighs 1.3 million pounds. Each has two large U-shaped tubes which have 9,727 U-shaped, three-quarter-inch-diameter tubes running through them. 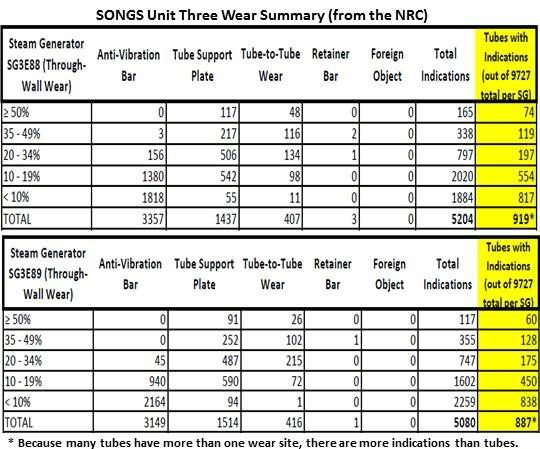 To prevent faulty tubes from leaking radioactive steam, plant operators do regular inspections and catalog indications of wear. If a tube is found to be severely worn, it is plugged.